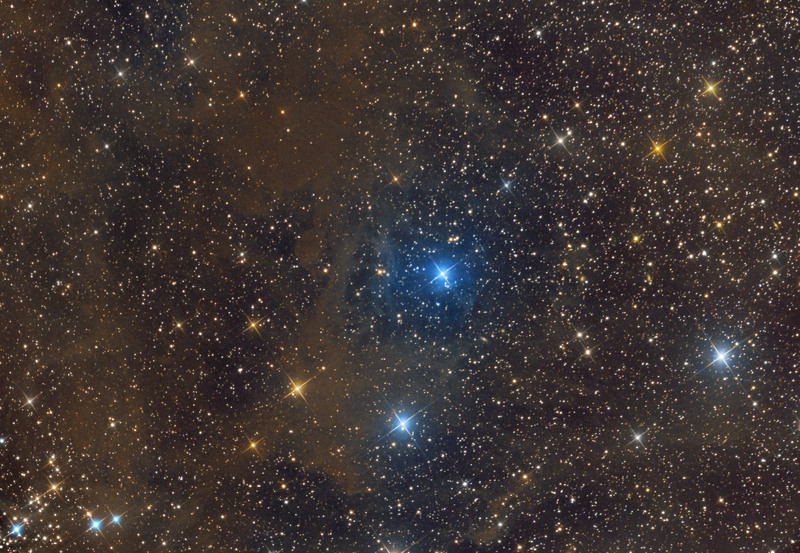 VdB 18 is a small reflection nebula in the constellation Perseus. It is situated exactly halfway between the two stars Algol and ξ Persei and about half a degree northeast from the open cluster NGC 1342, which is visible in the lower left corner of the image. The nebula is illuminated by a blue star cataloged as HD 22114 and also known as V496 Persei, a variable from type α2 CVn. This nebula is located over the northern edge of the large complex known as Perseus molecular cloud and appears linked to a dark nebulae system directly connected with the California Nebula, visible to the southeast. In the region they are a lot of star formation phenomena, witnessed by the presence of young stellar objects. The distance to the system is estimated to be about 900 light years.